At a time when many Muslims will be debating the definitions of bid‘ah and the condemnation of people based upon whether they don’t celebrate the ‘Eed Milād’l-Nabi or do, where some will find excuse to mix and party and others will find reason to have a quiet reflective moment, perhaps it would be pertinent to remind ourselves exactly what this debate is all really about. What is known for sure though is that the Prophet (sallallāhu ‘alayhi wa sallam) was born on a Monday and is indeed perhaps one of the reasons he fasted on a Monday as he (sallallāhu ‘alayhi wa sallam) stated and as collected in Sahīh Muslim. We likewise fast on Mondays in celebration of his Sunnah. Yet within the discussion surrounding the birth of the Prophet, many people don’t get further than either the fact that we simply fast on a Monday as a result of it or on the other side, hold celebratory functions in which devotional songs are recited. Perhaps both parties would do well to not miss the wood for the trees and reflect upon an individual who simply cannot be reduced to a Mawlid gathering or a chain email warning of deathly innovation. Thus let us start and look at who then was born that great day! Physically speaking, the Prophet Muhammad (sallallāhu ‘alayhi wa sallam) was the most handsome of people. He was of medium height, not too tall and not too short, of medium build, of white going slightly red-brown skin colour, with a completely full head of shiny black slightly curly hair that would reach to his shoulders at its longest, hair which was sometimes dyed slightly red and/or yellow, a taut neck, an extended black thick beard with a few white hairs, firm un-raised cheeks, a fine slender nose, wide white eyes with a slight reddish tinge with strikingly black pupils, a flat chest and stomach, well-statured, thick heavy hands with slightly long fingers, very soft palms, smooth large feet, no excess fat or flesh on the heels, and a gait of one leaning slightly forward when he walked. May Allah jalla wa ‘alā bless and bestow peace upon him. He had a large back, broad shoulders, in between which slightly to the left one could see the Seal of Prophethood – a slightly raised piece of skin with a small grouping of hair. May Allah jalla wa ‘alā bless and bestow peace upon him. He was always cheerful, of mild temperament and easy going, yet at the same time reflective and would spend much of his time looking down at the ground in contemplation. When he spoke, those sitting around him were so still that it seemed that birds were perched on their heads. When he fell silent, they talked but never argued in his presence. May Allah jalla wa ‘alā bless and bestow peace upon him. He was neither rude nor coarse and did not shout or utter obscenities. His did not find fault with others nor lavishly praise them. He did not interrupt another’s speech. He would interact with those who sat with him in the best of ways: he would never frown at them, treat them harshly or turn away from them, he would not point out slips of the tongue nor reprimand one for any coarseness in speech or the likes, and he would make excuses for them as much as possible. Whoever mixed with him would think that he was the most beloved person to him due to the attention he received, his kindness and the sincere advice he was given. May Allah jalla wa ‘alā bless and bestow peace upon him. He would honour the leader of every people and put them in charge of their affairs. He would show respect to the people of nobility and excellence and he would divide his time amongst them in accordance to their religiosity, yet there wasn’t a soul who felt they were not able to approach him due to his humility and welcoming nature. He gave everyone who sat with him his due share such that none thought that another was more honoured than he. If any person sat with him or near him to ask of him, he was tolerant and remained so until that person himself turned away. When someone asked him for something he needed, he either departed with it or with some consoling words. He had the kindest and best behaviour of all people, being like a father to them. May Allah jalla wa ‘alā bless and bestow peace upon him. He was easy going, soft, close to people, he answered the calls of those who called him, judged those who required judgment, fulfilled the need of those who asked of him – never preventing them from asking him and never letting them go disappointed or empty handed. When his Companions desired a matter from him, he would agree with them and follow them; if he determined to do something, he would consult them. He would accept their good from them and overlook their mistakes. May Allah jalla wa ‘alābless and bestow peace upon him. He was the most truthful of people, the most honourable. The people of the earth fought him, employing all means at their disposal yet none of them ever accused him of lying. His friends and foes alike would not describe him except as the most gentle, generous and empowering individual to walk the face of the Earth. May Allah jalla wa ‘alā bless and bestow peace upon him. His generosity did not come about through effort, neither was it hard upon him, rather it naturally arose due to the purity of his soul and gentleness of spirit. He had the most giving of hearts by virtue of the righteousness of his spirit and the great good contained therein. Kindness would pour out of his heart for it was enveloped in every beautiful moral and in every excellence. It is sufficient to end with the fact that the very greatest and noblest of people would all say about the Prophet Muhammad, “I have never seen anyone, before him or after him, who was comparable to him.” May Allah jalla wa ‘alā bless and bestow peace upon him. Allah jalla wa ‘alā sent him as a Prophet and a Messenger to the entirety of the worlds of Jinn and Man. He was sent as nothing but a Mercy to these worlds, one blessed with wisdom and guidance, with a criterion to establish right from wrong, truth from falsehood, and to bring the people from darkness into light. He was sent as a favour to mankind, and was sent to be followed. He was sent to be emulated and loved, to become more beloved to us than our parents and our children, even more than our own souls. It is in his cause that we are asked to sacrifice throughout our life for, and it is through his praise that we will attain the true success in this world and the Hereafter, by ultimately achieving the love of the Divine Himself. It is his Sunnah that we study, revise, memorise and implement. We then internalise it, promote it, then teach it, defend it, protect it and die for it. At this moment then, let us revive his Sunnah by not indulging in actions contrary to it, but by reflecting on the magnificence of the one who came with it and his attempts to keep the people straight upon its path. Let us reflect upon the actions of those supreme Companions whom Allah Himself is Happy with, and the way that acted upon this Sunnah and the way they remembered their guide and master and celebrated his coming. The Messenger was born and the world became illuminated as a result of that birth. Let us celebrate, not on the 8th, not on the 12th, not this month, and not even this year, but rather every single living moment of our lives as we now start to realise that we have been blessed beyond our wildest imagination to have even known of this great man: our master and leader, Sayyidina Muhammad. May Allah jalla wa ‘alā bless and bestow peace upon him. 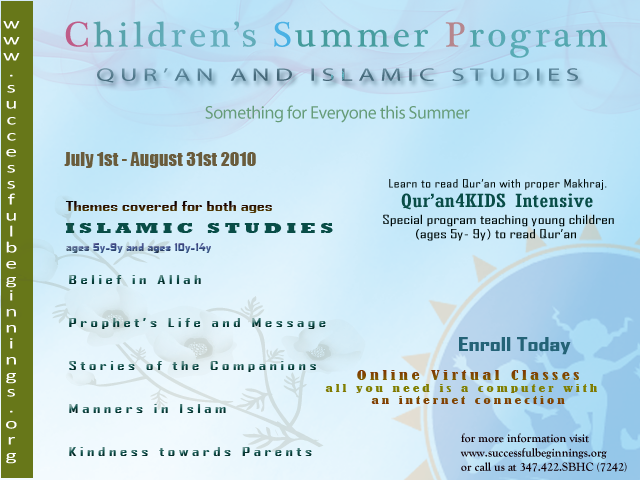 Keeping this in mind S.B.H.C has designed the Summer Program for Children. All classes are held in our Virtual Online Interactive Classrooms (VOIC). Upon registration the students will be given access to the VOIC rooms.